Edison, NJ - Jim Herman played in the group in front of Tiger Woods last week on the PGA Tour, giving him a little experience in coping with gallery noise behind him. Sunday at The Barclays was slightly different. It wasn’t the size of the gallery, it was one person. Donald Trump came out to Plainfield to watch him play. 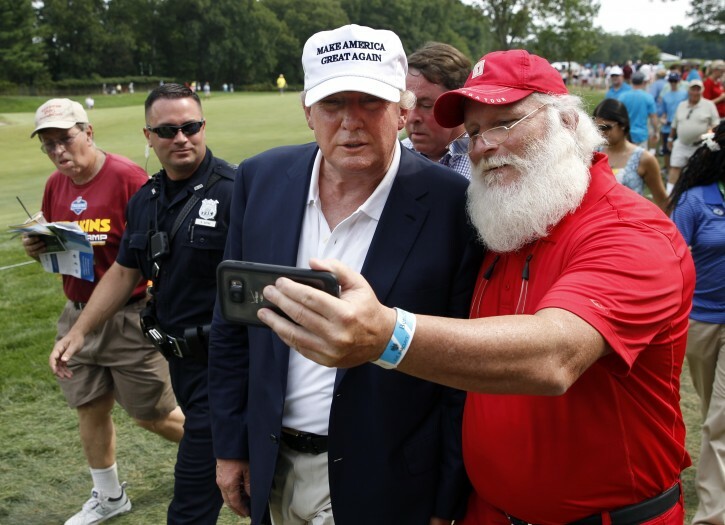 The Republican presidential candidate marched along the ropes on the back nine with fans — including one dressed up as Santa Claus — wanting handshakes and selfies. Trump was in campaign mode, except when he stopped the crowd and his security detail as Herman and Pat Perez stood over their shots. “Talk about location!” he yelled to a group of fans in the front row of a grandstand, all with cellphones in hand. From a hospitality suite, fans shouted, “2016,” and “Mr. President” and The Donald gave them a thumbs-up and waved. 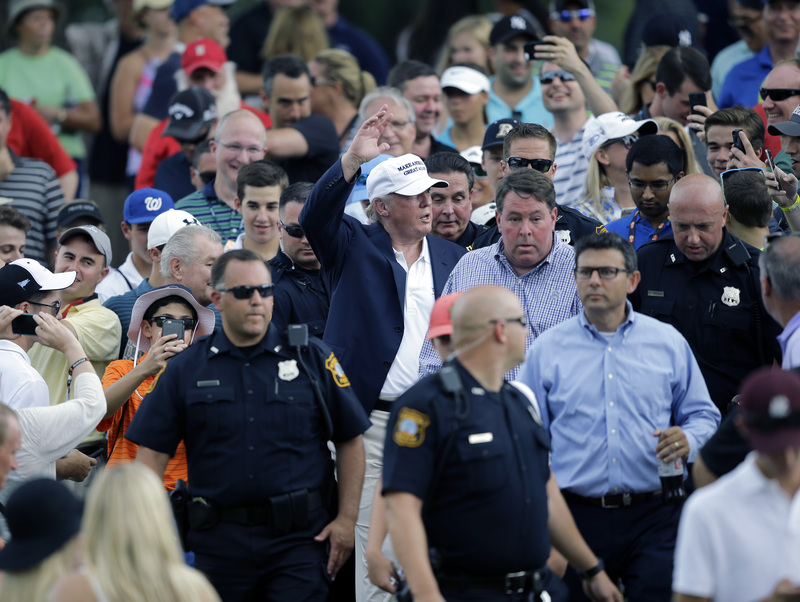 He twice turned down a cart ride from PGA Tour security as he headed for a military suite. He was expected to meet with PGA Tour Commissioner Tim Finchem in a hospitality suite later in the round. Golf has gone quiet in the months since Trump launched his presidential campaign and referred to Mexican immigrants as “criminals, drug dealer and rapists.” The PGA of America chose to move its Grand Slam of Golf away from the Trump course in Los Angeles; it has not announced another course. A World Golf Championship is held at Trump’s course in Doral. 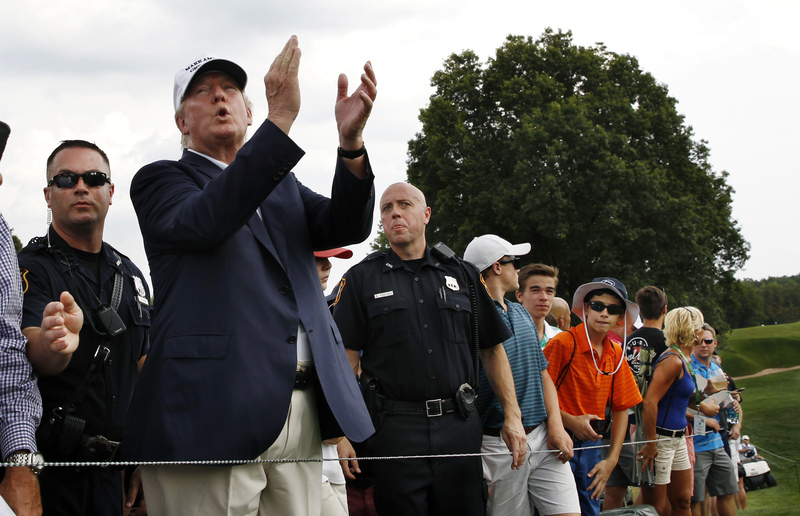 The PGA Championship is scheduled for Trump National in New Jersey in 2022 and the Senior PGA Championship at Trump National outside Washington in 2017. The U.S. Women’s Open is to be played at his New Jersey course in 2017. There wasn’t much of a gallery with Herman (and Perez) until Trump showed up, but there was a reason to follow that group. Herman was an assistant pro at Trump’s golf course in nearby Bedminster until Trump encouraged him to give the tour another try and backed him financially. Herman, who wears “Trump” on the crest of his golf shirts, made it to the Web.com Tour and is in his four year in the big leagues. This is the first time he has qualified for the FedEx Cup playoffs for being in the top 125, and he is assured of at least the second of four playoff events. It was hard to ignore the commotion behind him, though Herman didn’t mind. Perez, who is of Mexican heritage, might have enjoyed even more. Trump your the man. Can't wait to meet you on 13 ave. In boro park.